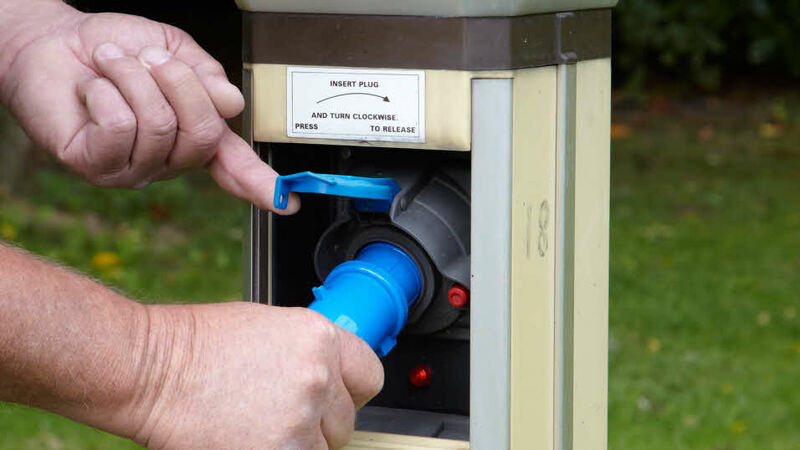 Use our helpful step-by-step guide for hooking your caravan or motorhome up to the mains to make sure you have a safe and enjoyable touring holiday. Check your Caravan Isolating Switch is at ‘OFF’. Uncoil the connecting cable from the drum (a coiled cable with current flowing through it may overheat). Take your caravan electric hook up cable and insert the connector (female end) into the caravan inlet. Insert the plug (male end) into the site outlet socket and turn it clockwise until it locks. Switch your Caravan Isolating Switch ‘ON’. Insert a polarity tester into one of the three pin sockets in the caravan to check all connections are correctly wired. Switch your Caravan Isolating Switch ‘OFF'. At the site supply socket, press the release button and withdraw the plug. Disconnect the cable from the caravan. Never leave a polarity tester in the three pin sockets. Don’t use the supply if the polarity is incorrect. If at any time you do not receive power or have any other electrical problem which you do not understand, it’s probably best to call in a qualified electrician. If you overload your mains system, a circuit breaker will disconnect your supply – site staff will be able to reconnect you. If you connect faulty appliances to the system the safety devices may disconnect your power and the power of others on-site. Should a fault occur only investigate if you are disconnected from the supply - the trip in your caravan may need to be reset. If your cable is damaged, never cut, re-join or tape-up and never wrap any connection in polythene sheets - the condensation that forms will easily conduct live electricity. What appliances can I use? Nearly all Club sites supply a maximum 16 amps. This means that at any one time the total of all appliances in use at an individual pitch can’t exceed 16 amps. If possible, we’d prefer you to limit the use of electricity during periods of high demand by using low wattage appliances. Here are a few examples of some appliances and their approximate ampage. As a guide, 230 volts an appliance of 1 kW (1000 watts) uses about 4.3 amps – this should help you work out the others. Fuses used in plugs should be the size recommended by the appliance manufacturer. Before you replace any blown fuse you should establish what the cause is and never increase the size of the fuse above the rating specified. Using the mains electricity won’t affect your outfit’s normal 12 volt electrical system directly; although it may keep an on-board battery charged up to help keep the 12 volt electrical system working. All electrical equipment you use in your outfit should preferably be double insulated and show the BEAB or CE Approval sign. To be safe, an outfit’s mains wiring installation should be carried out by an electrical expert and you should ideally have an inspection and written report once every three years by an appropriately qualified contractor. A new outfit will have mains wiring installed correctly if it has a National Caravan Council (NCC) certificate. The electricity supplies on all Caravan and Motorhome Club sites are protected against earth faults by a Residual Current Device (designed to prevent you from getting an electric shock). They’re also protected against over currents by miniature circuit breakers. (Check that a similar standard of safety is provided on any other site you stay on). The supply must be taken into the caravan by means of an electrical socket; do not take a lead through a window to electrical equipment inside the outfit. If you’re staying on a non-Club site and equipment is not to International Electrotechnical Commission Standard, replace your plug with the type necessary for that site and double check it’s correctly wired up. When you’re staying on our Club sites, we have a great deal in place to ensure you have a safe and enjoyable holiday but please be aware that when it comes to hooking up to our electricity your safety is your responsibility. The Caravan and Motorhome Club and any other site management can only be responsible up to the socket outlet to which you connect. Therefore you’ll be responsible for the connector cable, plugs and all electrical equipment in your outfit. We cannot accept responsibility for any accident that arises from your use of the electrics. This includes any trying to connect unsafe or unsuitable electrical equipment to the site socket outlet. As the site staff are not qualified electricians, they’re unable to provide any services relating to the supply of electricity from the site socket outlet to your outfit. They will however be able to advise you about the connection and disconnection of the supply at the socket outlet. If the site staff have any reason to be concerned about the safety of the outfits’ connection, they may be required to decline to offer a supply. This is in the interest of keeping the site as safe as possible for all its visitors. The Caravan and Motorhome Club cannot accept any responsibility for loss, injury or damage caused by any assistance provided to members save in respect for the connections or disconnection of the supply from the socket outlet. BS EN 60309-2 (corresponding to IEC 309/CEE17 maximum 16 amp, three pole socket with recessed tubes, tubes not pins at live outlet for safety). Some sites may have overhead cables; take care if you have high aerials on your outfit not to let them touch. B* CONNECTING CABLE harmonised code H07RN-F or H05VV-F or equivalent (BS6007 or 6500) 25 metres maximum (+ or – 2 metres) long of three core cable (live (brown), neutral (blue) and earth (green/yellow)) each core of 2.5mm squared section. Shorter cables may not reach from the bollard to your van on some sites and extra connector cables to add length are not permitted. The Club cannot accept responsibility for any damage or injury caused by the use of extra connector cables. We recommended that the cable is coloured orange for visibility in long grass.